Presidents Trump and Obama's rhetoric on immigration are strikingly similar in at least one respect: they both promise(d) to be tough on bad guys and welcoming of good guys. Obama vowed an enforcement regime that focused on "felons, not families." Trump promised to go after the "bad hombres" while letting in the "wonderful people." Every politician loves a "good-vs-evil" scenario but binary thinking -- especially when presented in stark moral terms -- is a precursor to policy failure and division. Scores of millions of people around the globe would like to resettle in the United States. In a paradigm that assumes immigration restrictions are good only when applied to bad people, we are forced to conclude either that most would-be immigrants are bad or that most immigration controls are. This is the false choice presented to us by most of our so-called leaders in politics, media and advocacy. In his new book, Melting Pot Or Civil War (Penguin Random House, Amazon), Reihan Salam makes several policy proposals that will be debated, but he most significantly contributes to the way we think about the immigration debate by rejecting the false-choice narratives that poison our national discourse. Immigration policy is not about whether to be welcoming or hard-hearted. Short of absolutely open borders, which most advocates of more open borders at least claim to reject, it is about compromise. Like it or not, we need to weigh competing interests and moral goods, and to adjust our approach over time. The great insight of Melting Post Or Civil War is that fidelity to good-vs-evil thinking and feel-good narratives blind us to crises that are taking place right in front of our eyes. We are failing our children who are living in poverty, arguably none more so than the children of immigrants. Half of children in immigrant families in America struggle to make ends meet and, as emerging adults, it will be more difficult for them to escape poverty than those in the mid-20th century, when high school and college educations were less the norm. Thinking in terms of generations, not election cycles, the potential damage to our egalitarian ideas is profound. Eight out of ten of this group of impoverished children already here are non-white. For decades, U.S. immigration policy has brought in millions of poor people (the only developed country to do so until the recent European migration crisis) and continually replenished the ranks of low-wage workers who, while better off economically than they were in their countries of origin, do not earn enough to live financially-independent lives in America. In order to avoid thinking about the growing underclass of poor immigrants, we focus on the superstar stories of a few and pretend that they are reflective of all. There is no question that a disproportionately large share of immigrants are impoverished and that many arrive in the United States with minimal schooling and poor English-language skills. Why, then, are we so fixated on a minority of high-achieving immigrants and their children? My theory is that while the child of well-off immigrants who wins the science fair tells us exactly what we want to hear about ourselves, the one who doesn't have enough to eat is a rebuke: a reminder that rags-to-riches stories delight and inspire us precisely because they are so rare. The fact that Sergey Brin, the celebrated cofounder of Google, was born in Russia (to parents who were accomplished scholars) is a feel-good story. The fact that 70 percent of Hispanic infants in America are born to mothers with a high school diploma or less, most of whom are either in or near poverty, is a feel-bad story. Elite immigrants and struggling immigrants aren't defying the logic of America's caste system. They and their children are being incorporated into it. The children of struggling immigrants tend to struggle. The children of elite immigrants make their way into America's elite, where they add a much-needed dash of superficial diversity -- just enough to make us forget their inconvenient working-class counterparts. In a nutshell, the thesis behind the book's title is that bad things happen when inequality is marked by racial and ethnic divisions and large flows of low-skill immigration makes the problem worse. For years, low-skilled immigration has boosted the number of low-skill workers, and by extension the number of low-income households. Low-skill immigrants can increase their incomes dramatically by moving to the United States, but even then, they are likely to be poor by U.S. standards, for the simple reason that demand for low-skill labor in the United States is in secular decline. While low-skill immigration has greatly enriched immigrant workers themselves and the affluent professionals who rely on them most, this compositional effect has pushed up the poverty rate and kept large swaths of our economy stuck in a low-wage, low-productivity rut. "Today's poor immigrant are raising tomorrow's poor natives," Salam writes. And if we don't break the cycle, he envisions a nightmare scenario where "low-wage immigrants and their offspring constitute a new underclass" and "class politics will be color politics." The subtitle of Salam's book is "A Son of Immigrants Makes the Case Against Open Borders" and he writes about being in an "uncomfortable place" after the 2016 election, when he had to balance his response to Donald Trump's divisive rhetoric with his conclusion that Trump's opponents "who want more immigration and a more equal society...are crushingly naïve." There may well be a powerful moral case that wealthy Americans ought to replace their air-conditioning units with a rotating cast of earnest young people who would be willing to fan them around the clock. Yet it is hard to deny that doing so would be rather inconvenient. At the very moment that large swaths of America's existing working class was reckoning with the downsides of offshoring, the United States welcomed an entirely new immigrant working class, which was more geographically flexible and more desperate to get on the bottom rungs of the service economy. We didn't welcome quite enough immigrants to compete with low-wage labor in China, mind you. But we did invite enough to greatly expand the potential supply of service workers, and to prop up old low-wage business models in the service sector and create entirely new ones. 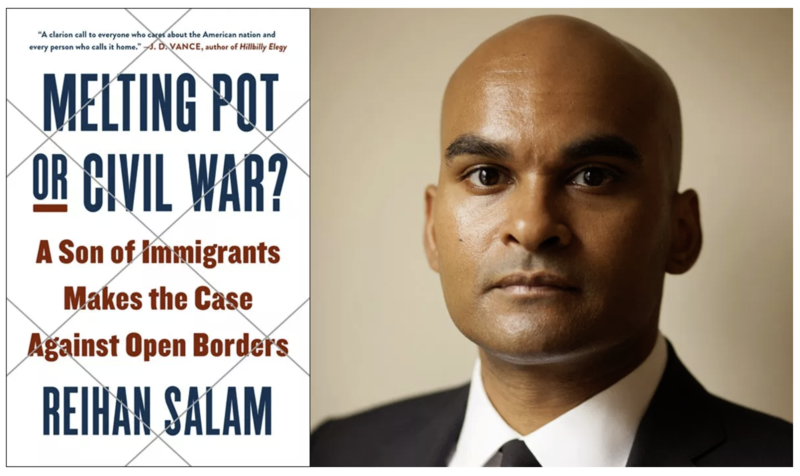 Salam's chief immigration concern is how current policy "is undermining civic solidarity, producing ethnic balkanization, and breeding polarized backlash" that could lead to something like the "Civil War" in his book's title. Immerse yourself in pro-immigration literature, from the academy and the mainstream media, and you notice a curious pattern of argument: that uncontrolled immigration patterns have awakened racism and bigotry, but that it's nonetheless best to press forward with the permissive policies that have ostensibly produced this conflict......It is almost as though these thinkers believe things have to get worse before they can get better -- that traditionalists who worry about the pace of cultural change need to be crushed rather than accommodated, especially when it comes to immigration policy.What this line of thinking misses, however, is that there is nothing intrinsically racist about adopting an immigration policy that would be less likely to spark a nativist backlash. And until we recognize that, our politics will only get uglier. Melting Pot Or Civil War? feels primarily aimed at expansionists who have not yet dug themselves too deeply into an anti-borders position, but restrictionists will find much in the book to debate as well. For instance, in return for a skills-based system, Salam proposes a large-scale amnesty with enforcement to follow (even as he acknowledges that the promised enforcement in previous amnesty-first laws have never materialized and that anti-enforcement advocates continue to be successful at tying up immigration-control measures in the courts -- the obvious question, "Why would they stop after the next amnesty?" goes unanswered) and although he sees immigration reduction as a "defensible" position, he would accept a million green cards per year as long as they were skills-based -- a position sure to rile already-squeezed middle-class workers as well as Americans concerned about the demand another 100 million people will put on infrastructure and natural resources over the next five decades. There will be trade offs to any immigration policy. We must be courageous enough to discuss them. To that end, Salam's book is an appeal to our better natures to step down from the rarefied air of feel-good false choices and jump into the gray area of real-world challenges and ideas. That is a proposal that deserves universal support.